Allan Kelson's Chi Kung (Qi Gong) & massage Clinic. with cronic illness referred by other health practioners. "We prefer to help those who will help themselves"
Try a Chi Kung (Qi Gong) Class. For class details, click here. Click here for new beginners students who are just getting started. Clinic venue address is given after initial phone consultation. 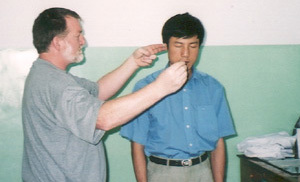 Allan Kelson treating Dr Cai Jun with Special Chi Techniques. Dr Cain Jun, head of the Chi Kung department of Xi yuan Hospital was the first person to receive a Master's Degree in Chi Kung from the Chinese Government. 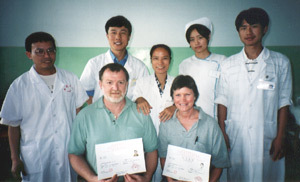 Allan Kelson and Heather Smith receiving their certificates in Chi Kung (Qi Gong) massage and Tui Na from Xi Yuan Hospital of Traditional Chinese Medicine (Qi Gong Clinic). In the picture are doctors and staff of the Chi Kung Department.